This product is estimated to be back in stock Monday April 29, 2019. Actual delivery may vary from this date. 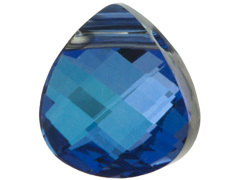 The Swarovski Elements 6012 15x14mm MaliBlue Flat Briolette is an elegant crystal pendant which will be the focal point of any jewelry project. The sparkling, precision-cut facets reflect light from every angle and the elegant flat teardrop shape lends itself to many varied jewelry applications, from a single, eye-catching necklace drop to a pair of stunning earrings. INM Crystal is pleased to offer the glittering Swarovski Crystal 6012 Flat Briolette in the 11mm and 15mm size in a variety of popular colors and finishes. For inspiration on using the 6012 pendant in your jewelry creations, please visit INM Crystal’s Idea Gallery. MaliBlue is a stunning special effect color exclusive to INM Crystal, containing shades of blue from light denim to deep sapphire. These gorgeous crystals have a base manufactured by Swarovski with an after market coating not applied by Swarovski. Variations in color may occur. Love the color! Used this size for a pendant and the smaller ..